On the night of the 15th July 1943, two MI9 agents, Dominique Edgard Potier, a Belgian Air Force Officer who had reached England in 1942, and Conrad Lafleur his French Canadian radio operator, were parachuted into south-east Belgium, near Suxy (Operation Manningtree). At this time, many Allied aircrew, on bombing raids over Germany, were being shot down over the Belgian Ardennes. Potier’s mission, known as Mission Martin in Belgium and The Possum Line in France, was to organise the recovery of these airmen, and shelter, feed, and provide them with false identity documents, before moving them on to safe houses in and around Reims in Northern France. Unlike the Ardennes, this area was suitable for evacuation by air, using Lysander aircraft. Of the six planned operations, three were successful; eleven airmen and one SOE agent were repatriated between Sept – Nov 1943. The Operations were: Brasenose [night of 13/14 September 1943] piloted by Sqn Ldr Hugh Verity (WNW of Reims); Operation Magdelen 1 [night of 7/8 November 1943] piloted by F/Officer Mac MacCairns (NW of Soissons), which delivered Georges d’Oultremont; and a double Lysander pick up on the night of 16/17 November 1943, by both Sqn Ldr Verity and F/Officer MacCairns (WNW of Soissons). This operation delivered Lucien Dumas and Raymond Labrosse of the Shelburn Line and returned with Edgard Potier and five aircrew evaders. Possum had contact with other escape lines and Resistance groups. It operated safe houses in Paris, allowing airmen to be received from the Comete organisation. The Bar-le-Duc organisation, under Robert L’Heurre, fed in airmen from the south-east. Possum provided airmen and escorts to the Jade-Fitzroy network for two MGB pick up operations from the coast of Brittany in December 1943: Operation Envious IIb [on the night of 1/2 December 1943] – hostile weather conditions, 7 evaders collected, 5 sailors left behind – MGB 318; and Operation Felicitate II [on the night of 25/26 December 1943] – 8 evaders/agents collected – MGB 318. 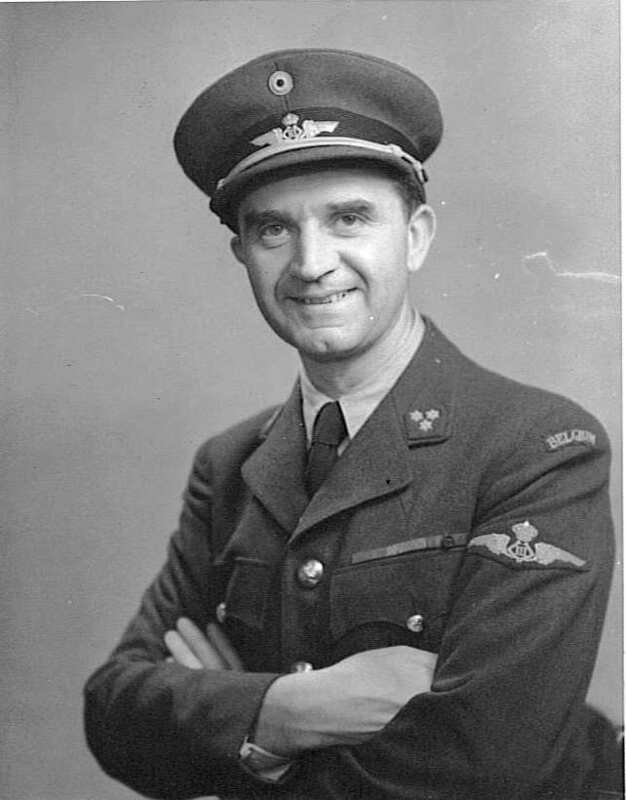 Potier returned to England in order to familiarise himself with the landing requirements needed for larger aircraft in order to take out more passengers, as safe-houses and secure accommodation for the downed airmen were becoming a problem. The Lysander could only, officially, carry three passengers – although on one occasion Potier squeezed in four and promptly received a reprimand from the Air Ministry. [Hudsons, which were also operated by 161 Squadron, were able to carry ten passengers.] During Potier’s absence the organisation was led by Georges d’Oultremont. Potier was parachuted back into France on the night of 20th December 1943. It had been his intention to move Possum to Amiens, as the organisation was becoming too ‘well known’ in Reims. However, on the 28th December, as Conrad Lafleur was on air transmitting messages to London, he was surprised by the Germans. He escaped, but it was the start of a sequence of events that eventually led to the arrest of Potier. 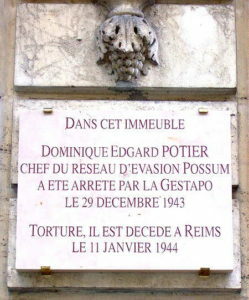 Potier was initially taken to Fresnes prison, in Paris, and then returned to Reims where, after being subjected to considerable torture, he took his own life on the 11 January 1944. As more arrests followed, the operation around Reims effectively collapsed. Paris, Amiens, and the remoter parts of the network continued operating for a few more months, but were eventually compromised, and broke up. Georges d’Oultremont and Conrad Lafleur escaped down the Comete Line. Of the seventy helpers arrested in the French sector of the Possum Line, some sixty were deported – less than half of them returned from the camps. There are no complete records, but it is estimated that some 60-70 airmen passed through, or were being sheltered by Possum to the time of its demise. On the 30th August 2008, the city of Reims unveiled a plaque to the memory of Dominique Edgard Potier. Present on that day was ELMS member Fred Greyer. We wish to thank Fred for providing the information about his father, Dominique Edgard Potier, and the Possum Line.